Advocate staff photo by CHARLES CHAMPAGNE — Guests of various faiths join the Interfaith Federation of Greater Baton Rouge sponsored event: A Diologue with Muslims Sunday, Jan. 31, 2016 at the Broadmoor United Methodist Church. Advocate staff photo by CHARLES CHAMPAGNE — The Interfaith Federation of Greater Baton Rouge sponsored A Diologue with Muslims Sunday, Jan. 31, 2016 at the Broadmoor United Methodist Church. Advocate staff photo by CHARLES CHAMPAGNE — Ali Abidi speaks about pilgrimage in the Muslim faith Sunday, Jan. 31, 2016 during A Dialogue with Muslims sponsored by the Interfaith Federation and held at the Broadmoor United Methodist Church. Advocate staff photo by CHARLES CHAMPAGNE — Zainab Ahmad speaks about daily prayer in the Muslim faith Sunday, Jan. 31, 2016 during A Dialogue with Muslims sponsored by the Interfaith Federation and held at the Broadmoor United Methodist Church. A handful of Baton Rouge Muslims took the stage in a Methodist church hall Sunday afternoon to explain their faith, answer questions and dispel a host of misconceptions about Islam. 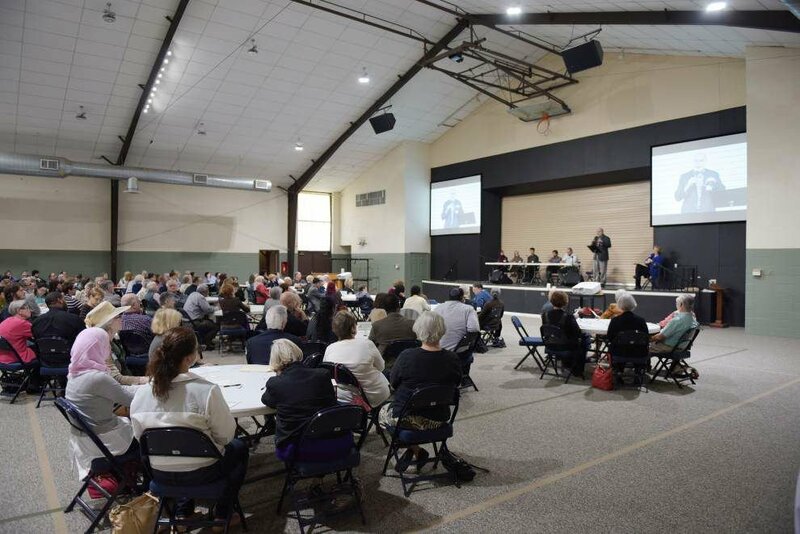 The meeting, organized by the Interfaith Federation of Greater Baton Rouge and attended by about 200 people, gave leaders from the Baton Rouge Muslim community an opportunity to address negative perceptions of their faith — and a chance for curious non-Muslims to ask a range of frank questions. In small group discussions, roughly 25 Baton Rouge Muslims spoke about everything from dietary restrictions to prayer habits. The frequent headlines linking the religion with terrorist groups like the Islamic State group drew plenty of questions as well. Terrorist actions cut against the basic tenants of the faith, Nofal said, and are carried out by only a very tiny fraction of the more than 1.5 billion Muslims worldwide. In the United States, Muslims have actively and consistently condemned and distanced themselves from terrorist groups, Nofal said. The Rev. 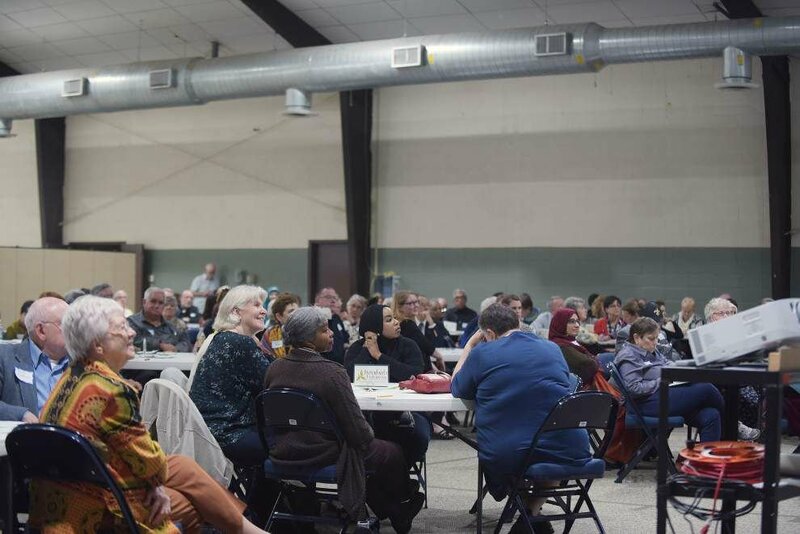 Fred Wideman, the senior pastor at Broadmoor United Methodist Church, which hosted the event, said widespread negative perceptions and misconceptions about Islam prompted the interfaith dialogue. Though he taught Middle Eastern history to students in East Feliciana Parish, Lusk said he’d only really gotten to know one Muslim locally prior to Sunday’s event. Lusk brought along a recent Time magazine article on Wahhabism, an ultraconservative Islamic movement centered in Saudi Arabia, and asked Zee Mohamed, an accountant and practicing Muslim, to explain how the fundamentalist movement differed from his own faith. Mohamed’s 26-year-old daughter, Rehana Mohamed, received plenty of controversial questions from people at her table, mostly about terrorism, but she said she welcomed the opportunity to address stereotypes and misconceptions. “It’s always better to ask a Muslim than to just ask Google,” she said. She called the association of her religion with terrorism unfair, especially since media coverage of mass shootings or terrorist attacks carried out by Christians rarely focus on their faith. “The double standard is messed up,” Rehana Mohamed said. Nofal also highlighted the notable success of many Muslim immigrants in the United States and their outsized representation in professions like engineering, medicine and business. Members of the Islamic Center of Baton Rouge come from a wide variety of backgrounds, Nofal said, including immigrants from around the world, fourth-generation Americans and recent converts to the faith. They also practice their religion in a wide variety of ways. “Some come five times a day, some come once a week and some visit the mosque only when they’re married and when they die,” Nofal said. Ali Abidi, a state worker at the Louisiana Department of Fisheries and Wildlife who spoke about the importance of the pilgrimage to Mecca, said his religion stresses the importance of being a good neighbor to those of all faiths — a point stressed repeatedly during Sunday’s event.